I love all the beautiful colors of fall. I also like the softer and more muted colors as well, so I've put together some simple fall touches of brighter fall colors and I'll show my softer shades in another post. I've posted about my little bookcase in our dining area before. We had to sell a few larger pieces of dining room furniture because they wouldn't fit in our dining area, they were no longer my taste anyway, so it was a nice change. We have very little wall space in the dining area, so I decided to use this simple little bookcase since it went with our small dining set. This isn't my ideal arrangement, but it will work until I find something to use in place of it. I wanted to turn this little corner into something colorful for fall and use some of the things I already had. 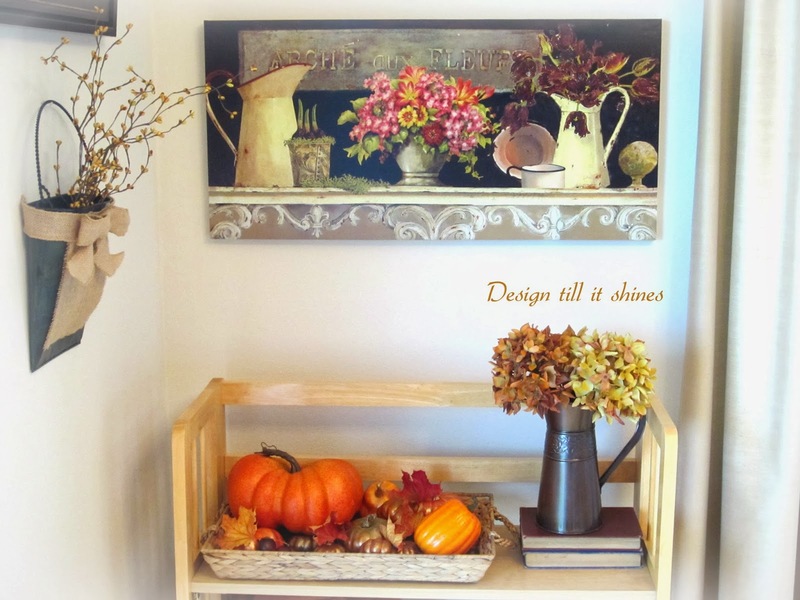 I decided to make it a french style fall space and started with the lovely printed canvas of a decorated french style shelf that I found at my favorite collectible store. Even though the flowers are pink, it had the look of a fall print to me and it was just the right size to fill up my blank wall. I used this as my inspiration piece and continued from there. 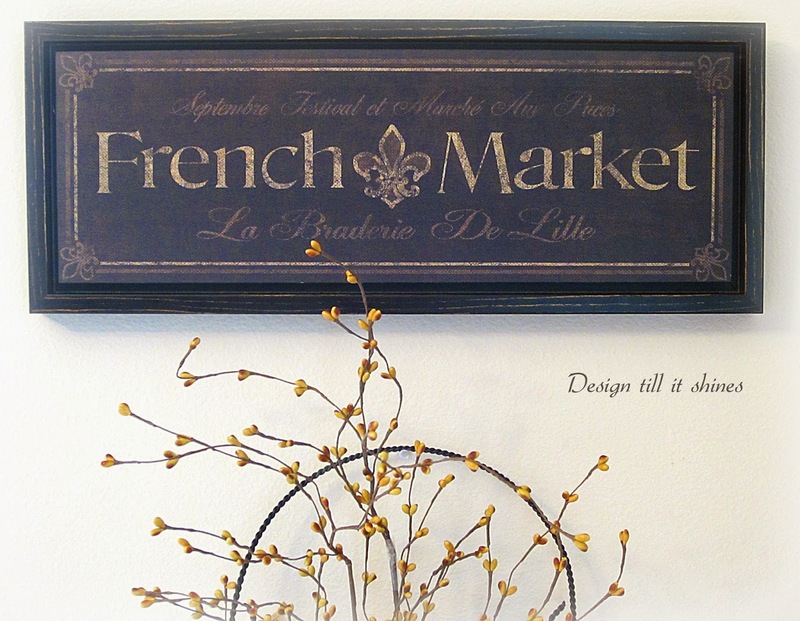 I already had this charming french market sign that I found at Target, so I added it as my starting point. 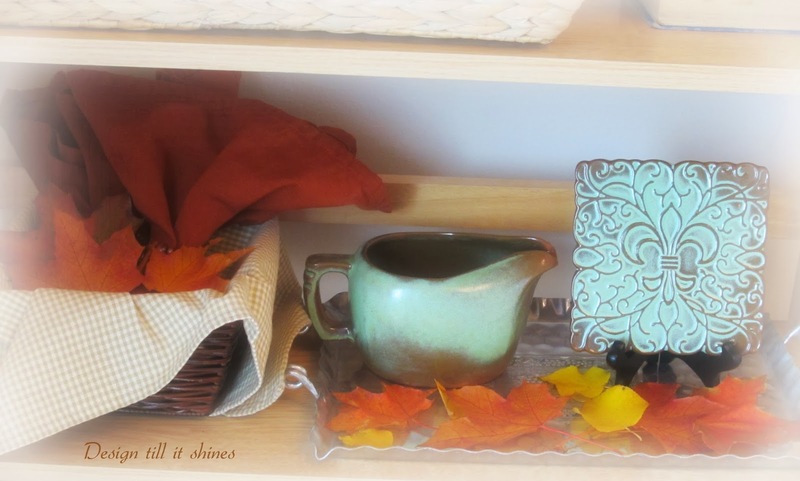 I found a woven basket that worked well on my top shelf and added some fall pumpkins that I already had with some newly fallen maple leaves. 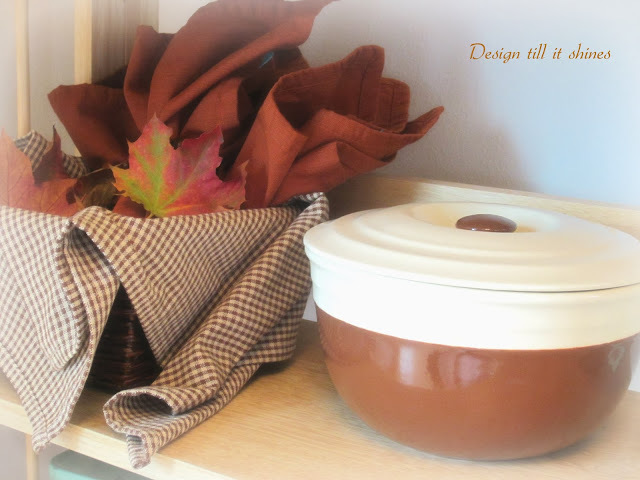 I like to use natural elements when I can, especially in the fall. I'm on the hunt for some acorns too! 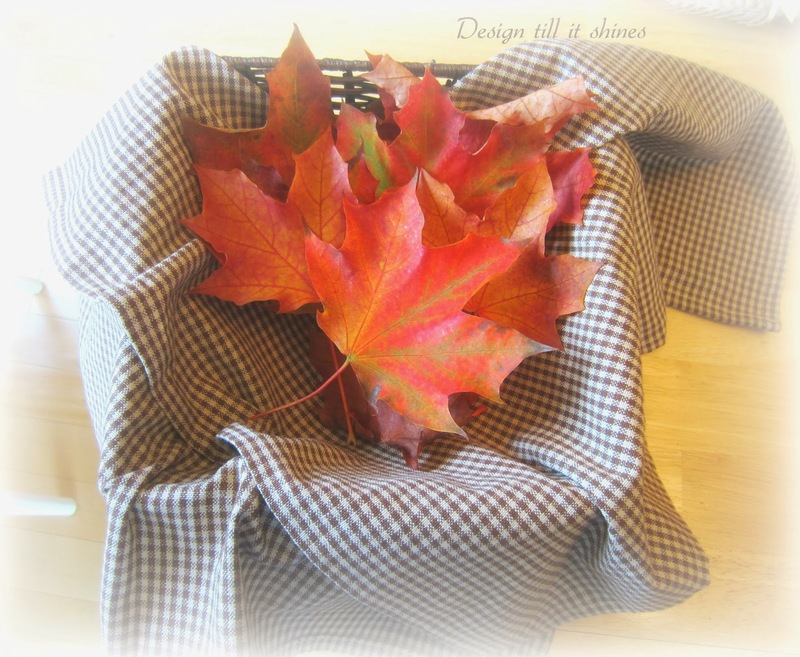 I added a small basket lined with a checked tea towel and more maple leaves. I like the frenchy farmhouse appeal of it. I have had this brown and cream bowl forever, it's one of my favorites and looks perfect for fall. I changed the decor on my second shelf a few times adding a couple of pieces of my Frankoma pottery. I've always loved the color of these pieces and thought they added a nice accent. The colors of the maples in our neighborhood have been gorgeous this year. Last year they were more subdued. A simple basket filled with a variety of colors of fall leaves makes an easy and inexpensive accent to your fall decor. 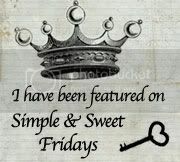 As I've mentioned before, I do love the simple things. Lovely veining in these gold colored leaves. 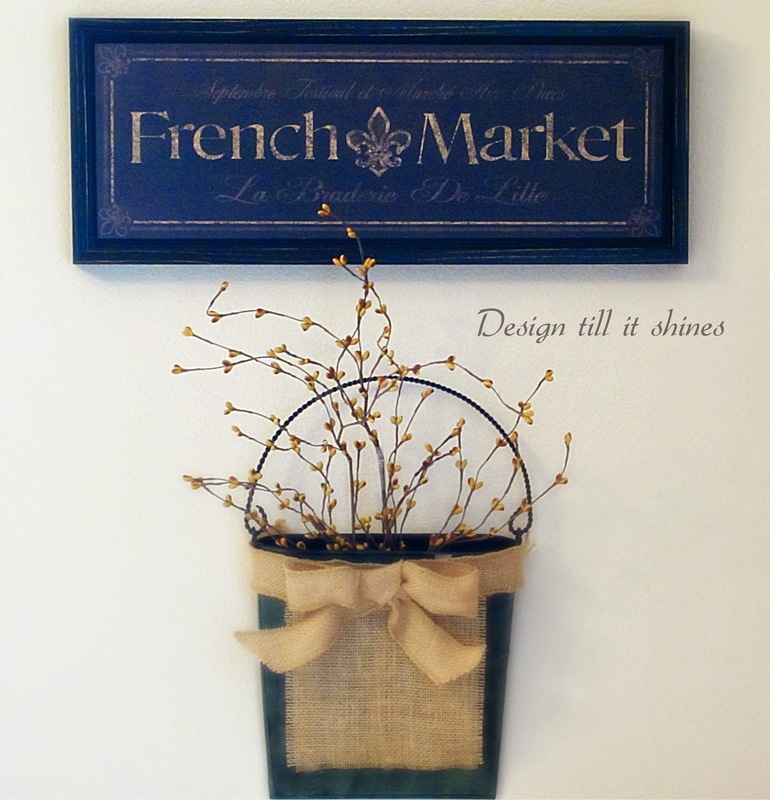 I tried a few things under this french market sign and decided I liked this wall basket the best. It already had burlap on it from a previous project, so all I had to do was add the natural looking stems that I found at Joann's. I really liked the soft golden color and the realistic look of the stems. The writing on the french sign has a distressed burlap look which goes well with the basket too. Like many of you, I love hydrangeas, especially dried ones. I don't have access to a hydrangea bush, but I was able to find some that looked rather realistic at Joann's. I really like the different shades and muted colors in these. 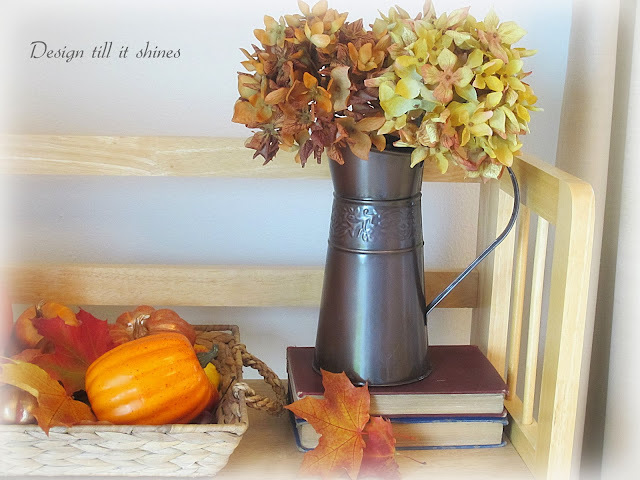 I added them to a simple bronze pitcher that I already had and completed my vignette. Originally I wanted my top shelf to replicate the printed canvas, but I knew that would be too much. There is a lot going on in that print, and I do prefer a simpler look, but it has grown on me and I like the color and french style it adds to this small dining area. You can turn even the smallest space into something special when it's filled with lovely things that reflect your style. Thanks for stopping by! What a sweet little corner! Great job! That is a great print that you found. And I like the Target sign too. It all looks very nice! This looks so lovely. I really like the brown ceramic items. I got so many great ideas from you post! I love that French sign and you wonderful Fall touches. 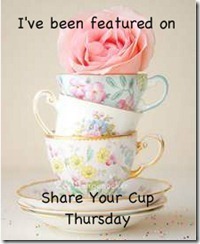 Thanks for linking up to TTF! Hi, Diane! 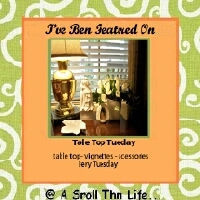 I'm stopping over from the 'Home and Garden Thursday' blog hop. I really like the simple design of your French dining room vignette.It's amazing what a little touch to the corner of a room can do! Both of the wall prints are adorable! 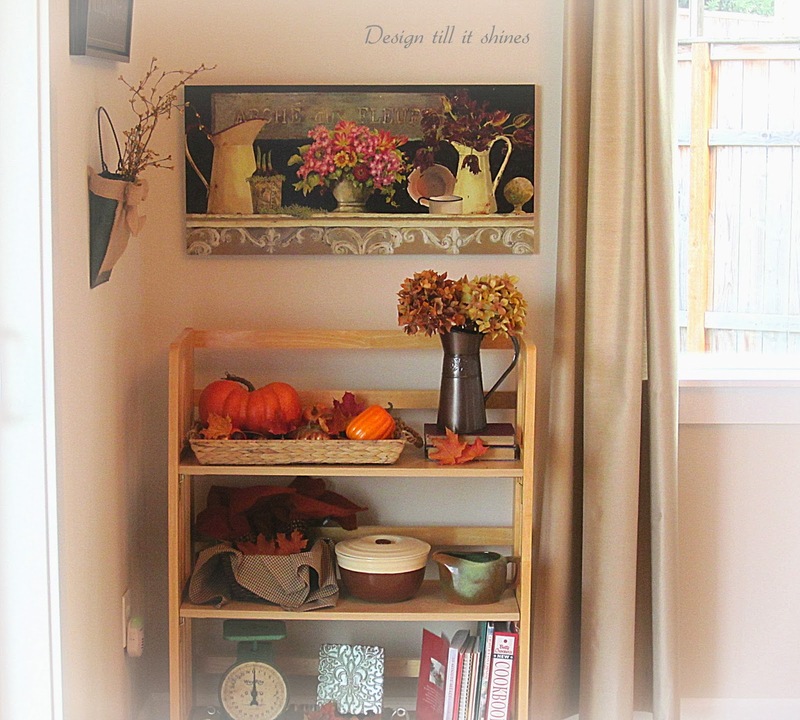 I used to live in the country and had many of the features in my decor that you have. Now I live in a cottage by a lake, so my style has changed quite a bit. Still love that French Country look, though! Thanks for sharing. Diane, what a beautiful little corner you created. I love, love the picture with the French pitchers! Thanks for sharing with SYC. 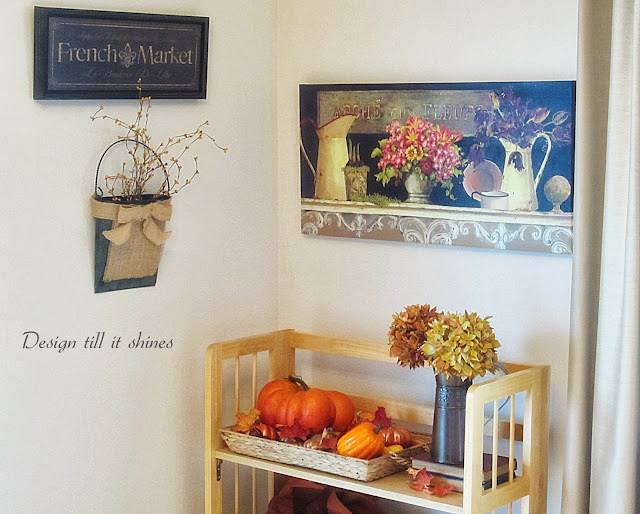 What a beautifully styled French fall vignette! 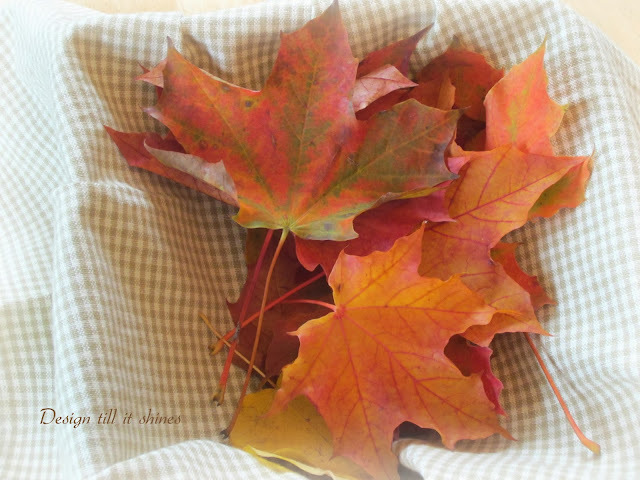 I appreciate the natural elements you have selected, as for me, they are truly what makes this season glow! 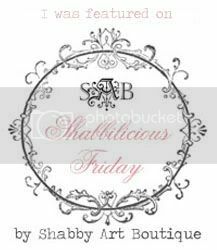 I adore that pretty printed canvas and I do believe that you have complemented its mood perfectly!! How cozy and welcoming this little corner is! 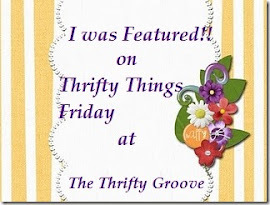 Thanks for sharing all the tidbits on how it came to life!